Is there some guy in Washington who thinks up national "fill in the blank" days? I always wondered about that. 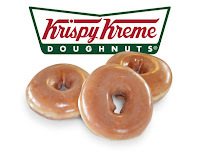 Anyhoo, today apparently is National Doughnut Day and Krispy Kreme is offering a FREE doughnut at participating locations across the US and Canada. No purchase necessary. Just go get one. If your Krispy Kreme doesn't allow it say, "hey, it's National Doughnut Day. What are you, a commie? Show your patriotism and give me a jelly-filled!" Update: Now Dunkin' Donuts is joining the cause - buy any beverage and get a doughnut free! Click here to view all the Krispy Kreme participating locations.